Ofcourse the title of this post is ironic. Here follows a video from an interview with the republican US senator Tom Cotton. In this interview he analyze the dangers of Iran and why it must be stopped (By this he obviously means to be bombed). One of them is because "They control Tehran" (See from 0:28 and onwards). No, this is not a joke! I believe that this senator have not made a mistake in the capitals. His opinion perfectly reflects and american-zionist policies of the last decades. A Nation is dangerous when it control its capital. Which mean the state and all the working facilities and everything basic that a country needs to run properly and making an autonomous policy based on the need of the Nation and its people. 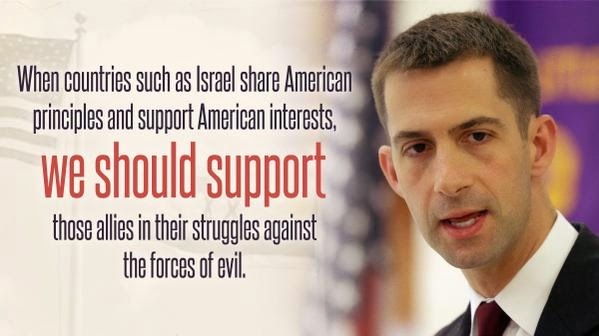 Tom Cotton is another good example of how dangerous are the people that serve the intrests of their zionist patrons. Iran is not Iraq or Afghanistan. A military move against Iran (the thorn in the back of jewish intrests in middle east) will drag the whole world into another war. Similar to what happened in WWII.